How to Become a Pilot & Find The Perfect Pilot-Plane Combination for Flight Instruction. Congratulations, on making the decision to become a Pilot you are now well on your way. The next step is to decide whether or not you want to be a Professional Aviator and fly a plane like the one below or just fly for the fun of it. Once you have made this decision you then have to decide on the best way to proceed. Their are several options to choose from, and we will look at each of them individually. This is a Popular Twin Engine Piper Navajo. If you have decided to become a Professional Pilot you would want to look into an accredited flight school or college like Purdue University Where they offer a "Professional Flight Technology Program" that includes everything you would need for more information click here. There are many flight schools to choose from. Most have financing Packages that they can set you up with along with lodging. If your desire is to become a pilot and you don't have the money.You might also consider joining the military like the Air Force, Navy or even the Army. By doing this the service would pay for everything and give you tremendous experience. Then once out, you could pursue numerous career options that would be wide open to you now. I have several friends that have done this and have no regrets at all. They were able to both fly and see the world while serving both God & Country. Always remember, where there is a will, there is a way. My five year journey to become a pilot began in 1979 along side my Father at a small country Airport. After many part time jobs and several different flight instructors in 1984 I finally realized my dream to one day become a pilot. Six months later my father at the age of 50 accomplished his life long dream of earning his Pilot License as well. Never ever give up on your dreams and one day you will achieve yours as well! This is a 7ECA Aerobatic Citabria Airplane. 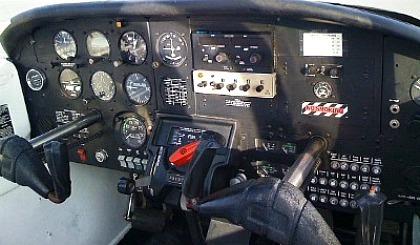 If you wanted to get your pilots license, what all would you need to get started? Here are the 5 primary items you would need to start down the road to becoming a pilot. •You have to be 16 years old to solo, and you have to be 17 yrs. old to get your License. •You have to be able to Read, write, speak and understand the English Language. •You will need a Third Class Flight Physical which will also become your Student Pilot Certificate. Find an Aviation Medical Examiner here Average prices run around $125.00. •Next you would need to purchase a Private Pilot flying kit to study and pass your FAA Test and they range from $75.00 to $300.00 depending which kit you purchase. •Plane and Instructor around $110.00 to $125.00 per hour on the average. "It can be done a lot cheaper though, read on to find out how". I highly recommend finding an Airport out away from the city. There’s a lot less chance of being taken advantage of and you will find the experience a lot more enjoyable and fun. The atmosphere is much more laid back and easy going. Here are some quick picks to help save you money while working toward getting your pilots license. •Find an Airport outside the city with older planes, and older pilots. Take your time and find the perfect one. •See if a friend or family member might loan you their plane to take lessons in and you would only have to pay for the Instructor and fuel. •Many times older planes rent for a lot less money and are great to learn in. Sometimes the older flight instructors will not charge as much either. They just love to fly, teach, and tell their stories from Aviation's past. In my experience you can’t go wrong learning to fly this way. It's really a great feeling to wake up early, drive out to an Airport in the country, smell the clean air and have the whole airport to yourself. Take a casual walk around the hangers looking at planes from the past. Like the Piper Colt, Piper Cub, Taylor Craft, Citabria, Cessna 140 or maybe an old Aeronica Champ. Then head back to the FBO for your flying lesson and enjoy the day. One of my greatest joys after I became a Pilot was when I began flying those classic from the past mentioned above. I loved every minute of it behind the controls. Diving, climbing and banking my way across the skies. When I am up there flying among all those beautiful clouds and blue sky.I am never more close to God, than at that very moment. How in the world can anything be more beautiful than that, it's just you, blue sky and God up there. When starting out with flying lessons it would be much easier and cost effective if you learned in a conventional gear plane first, like the one above. And yes that's my Instructor and I'm preparing to go up and have some fun in the wild blue yonder flying aerobatics, wow what a rush!! Tail Wheel planes are quite different to fly, and if you learn to fly them first.You'll have no problem transitioning to other type planes later. But if you started out in the Piper tomahawk or Cessna 152 like me, then believe me you, the transition is a lot more difficult. This is why the planes you select now for your training, are so very important. And could save you a lot of money later in your training. So give this a lot of thought before you decide on the plane you want to learn in. Why you want to consider Taildragger Instruction now, in the long run it will definitely save you a lot of money down the road. When I began taking Flying lessons, I wish someone had told me to start in a taildragger first. Not only would it have saved me money, there a lot more fun to fly. After I received my Pilots License and went to get my Tail Wheel Endorsement, it cost me an additional 10 hours in training. That was another $1,250.00 by today's prices just for my Tail Wheel Endorsement. 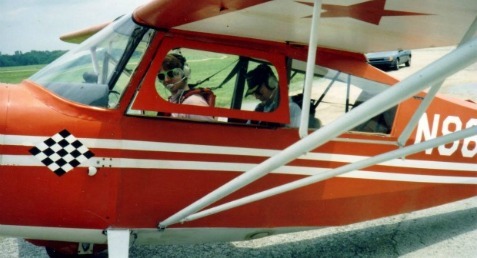 But for me it was more than worth the price, because I loved flying those great old classic taildraaggers. After soloing the taildragger like the one above you can continue flying it or at this point switch back to a more traditional trainer. Such a Cessna 152 or perhaps a Piper Tomahawk like the one below. Pilots call planes that have the wing on top "High Wings" and ones with the wing on the bottom "Low Wings". The high wing gives you a greater field of vision below and a low wing plane gives you greater vision above. Each plane has it's own unique features that you will enjoy about them. I'm partial to the Tomahawk because she was the first trainer I ever flew. If you ever get the chance to fly one, I think you would really enjoy it. Inside & out this plane looked great was a sweet heart to fly. Her flying characteristics were very predictable and stable. The Tomahawks inside cockpit is laid out just great. From the moment you set in this plane everything feels natural. The Engine Throttle, Fuel Selector and Mixture are all mounted on a center console for easy operation. The wing flaps are located between the seats with a lever, we don't want to forget about those do we. To become a pilot I think you would be money ahead by perhaps choosing an older flight Instructors, there is no substitute for knowledge and experience combined together.The younger ones are ok as well, but be careful some are only in it to build their flight time. Meaning they will take longer than it should in teaching you, so they can build their flight time using your hard earned money. So do your homework on instructors before you choose one, and make sure you get a really good one. Once again to become a pilot you will also need to choose a good ground school or begin a home study Course. Then when your ready, the Instructor can sign you off to take the FAA test. One of the things I found most beneficial was purchasing the Private Pilot Test Book with all 800 Question & Answers. If you memorize them all, you will ace the test. You may find it easier to order the King Private Pilot Video Course, which covers everything you need to successfully pass the written test. Normally you need 40 hours minimum yo get your license by the time you finish the average pilot will usually have around 50 to 60 hours. So figure on around $6600.00 to $7500.00 for your pilot license by the time you’re finished. Not so bad if you break that down over four years it would cost about $1650.00 to $1875.00 per year depending on how often you fly. See what I mean when you spread the cost out, easier to do it that way. That means you will fly about once to twice per month on the average and before you know it you'll have your license. Thanks again for landing on our site, and we sure hope you drop in for a landing again soon, as always, stay safe and "Happy Flying".